We come to the final step in our journey of discovery where we deal with the most important evidence of who Christ is. Our skeptics always return to this event because they claim that if they can disprove the resurrection that they can destroy the message and validity of Christianity as a whole. If they will “come and see” the tomb of Christ and investigate the appearances of Christ following His resurrection, they will have to come the conclusion that Christ truly is the “Son of God” and the “Messiah”. This message investigates the evidence of the empty tomb, the Roman Government involvement, the eye-witness accounts and the birth of the Christian Church as the absolute proof of who Christ Jesus really is. This Easter – I challenge you to “Come and See”! There are four times in the Gospels this simple phrase is used and it maps out a deeper and growing understanding of who Christ is as you move from the first until the last. 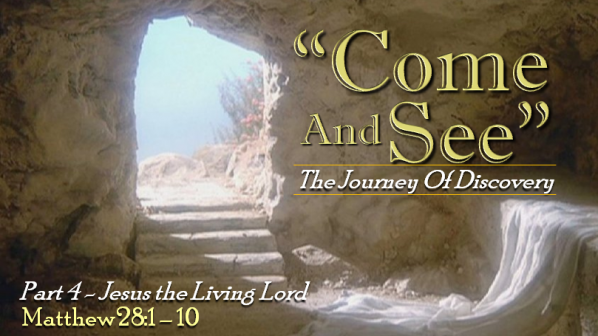 This Easter sermon series will walk the steps along the journey to discovery for the disciples and for all who will take a moment to “come and see”. First, we will look at the original call of the disciples and the few but powerful evidences that they had at the beginning of Christ’s ministry. Second, we will hear the words from the woman at the well as she and the disciples discover that Christ is more than just a man – but is He just a prophet? Third, we will recall the word of Mary, Lazarus’ sister as she invited Jesus to attend to a dead man – this scene will climax the teaching ministry of Jesus as He demonstrates His miraculous powers over life and death. Finally, on Easter Sunday, the angel brings us face to face with the ultimate evidence of who Christ is – the empty tomb. You are invited to walk with us on the journey to discovering for youself exactly who is this Jesus Christ.